In practice, as a sure bet, a bet can be placed on the same football match we bet in one bookie at odds of 3.20 in another bookie the draw with the same odds and the away win will bet at a bookmaker with the odds. In this case, we bet on all the tips the same deposit and winnings are guaranteed. If the situation is such that the odds are different, it is adjust the deposit so that we can win every betting odds the same amount. It is clear that bookmakers watch each other's odds, surebets are very rare. Nevertheless sometimes can occur. It is also necessary to keep in mind that odds in Trefik can have a couple minutes delay, and it is possible that the bookmaker has just changed the odds. Therefore, it is advisable to check the real odds before placing the bet. Another fact is that the profitability of the sure bet is in the order of units of percent of the stakes settled. This is not a breakthrough. But the magic is that it is about certain profits. In addition, the matches with surebets are for the bettors interesting, because different bookmakers have more different odds than usually. 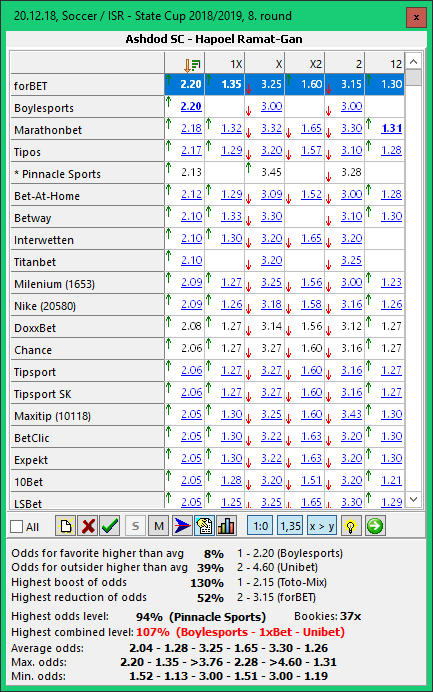 And the bettors can ask WHY the odds values are so different ..
Trefík allows you to search for surebets not only for bets on the total result of a match but also for side bets (parts of the game, handicaps). If the name of the bookie is displayed as a link (ie, blue), you can click on this name to view directly the website of the bookmaker with the current odds for this match. It is thus possible to quickly and easily check the currently listed odds - this must always be done before placing surebets!